Josh Freeman took some production stills for The Blood Countess and whey were awesome! See Josh's stuff at: http://www.obeymybrain.com/. Take a look at the photos and, to see the play, visit http://dangerhouse13.com/. King of Roller Disco: You may rise. Yeah. 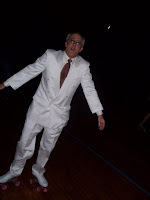 That's me in a white suit, white roller skates and pink wheels. I am pretty much the fifteenth best roller skater at Skate World in Linda Vista. Don't believe me? Watch the video below! But The Blood Countess has other plans. Much has been made of Elizabeth Bathory. Operas, ballets, films, novels and now a world premiere stage play by Kevin Six. What is it about this woman that such a chilling mass murderer cannot command the same respect as Count what's-his-name? Ilona Black comes to Transylvania to right this wrong and bring infamy to the name of Bathory with the help of her friends Darcy & Dot, the mysterious Minister of Culture and a Romanian handyman who wants to be a DJ. But working with vampires has its drawbacks. When The Blood Countess wakes and readies herself to bathe in your blood will you be ready? Kevin Six has been acting, directing and writing for the stage for over 30 years. He was the 2009-11 playwright in residence at Swedenborg Hall. His play The Art of Love won the 2008 Script Tease of Short Plays. His play The Cake Women was published by Smith and Kraus and his play, Love Negotiated was produced to critical success in 2008; it will be published by Next Stage Press in early 2012.